Drew is an Artistic Associate with Faction of Fools and Constellation Theatre, he has also performed locally at the Shakespeare Theatre Company, Olney Theatre Center, 1st Stage, Keegan Theatre, and Rep Stage. 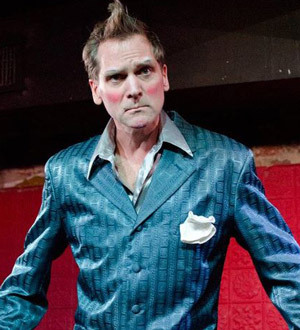 Regionally, he has performed with Everyman Theatre, Virginia Shakespeare Festival, and Great Lakes Theater in Cleveland Ohio. He performedat the Idaho Shakespeare Festival in the summer of 2013. The Renaissance Man is (really) Christopher Davis; actor, author and comedian. In an effort to put his degree in Philosophy from Villanova University to the best possible use, he's been entertaining and educating audiences of all ages since 1988. 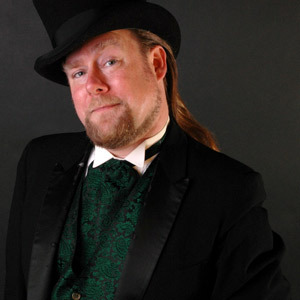 Shakespeare, Poe, Dickens, Greek Mythology and Kipling provide his material for interactive school programs which make history and literature more accessible and enjoyable, while giving audience members a chance to take a meaningful role in the performance. Oh...and juggling! Kolleen and Bobby Kintz stumbled into the world of clown at the Dell'Arte International School of Physical Theater in California (where Kolleen attended, and Bobby loyally supported the ensemble as resident photographer). 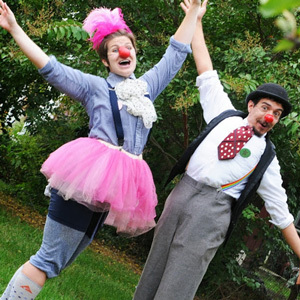 In 2011, the duo returned to Maryland and began volunteering with Clowns Without Borders, helping spread joy and laughter through programming at inner city schools, festivals, and coordination of local fundraising. In 2012, Kolleen traveled with CWB to Indonesia, and this fall the two will make their first voyage together, to perform in Haiti! The Kintz Family Circus, as they call themselves, works annually teaching camps where little ones can experience the magic of clown, learn skills, and create a show of their very own. 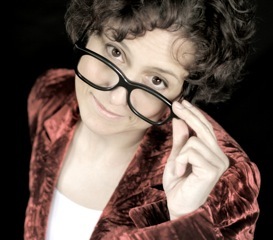 When not training at The Center for Movement Theater with Dody Disanto, these two are working on creating original and wacky pieces of theater, in and out of the red nose. 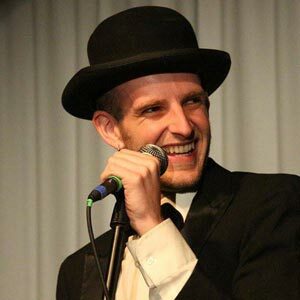 Matt Kaiser has been doing stand up comedy, improvisation, mime, clowning and fun things with props since 2006. Matt graduated from Towson University in 2010 with a BS in Theatre. Since graduating, Matt has taken improvisation and writing classes at Second City in Chicago, and he regularly visits Towson University to assist students for Towson's Techniques in Comedy class. Currently, Matt is teaching a comedy workshop at the Hussman Center for Adults with Autism at Towson, and is also developing independent comedy workshops for the Maryland and DC area. 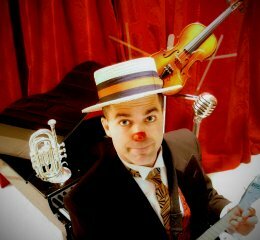 Rich Potter is a co-producer and frequent performer for Clown Cabaret. He's studied with Ringling Bros, Maine's Celebration Barn Theater, and Nouveau Clown Institute in Barcelona, Spain, and still hasn't attained his dream of knowing nothing. His appearances on the David Letterman Show, at the Vice Presidential Mansion, in Ringling Bros. and Barnum & Bailey Circus, and other domestic venues and in dozens of other countries have gotten him a laugh or two.